The hot new release iDeer Vibration Platform has a robust construction and a very slim and modern design. With the high-frequency vibrations, it will create a stretch reflex and contraction in your muscles throughout your whole body at different speeds. It comes with two resistance bands for you to work on your arms and upper body as well. With the modern white and black remote control you can turn it on and off, and change the speed without having to get down on the main control panel on the platform. It has an anti-slip textured surface and four suction cups for you to stay put and stable as it won’t slide during your workout. With a heavy-duty frame and a new hundred percent ABS material and high level of safety and stability it can carry a maximum user weight of 330 pounds. 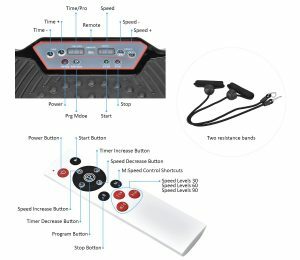 iDeer Vibration Platform is offered in black, blue, red and white colours as 9 different models you can view at Amazon.com product page. It is designed to help enhance your blood circulation, help you burn calories and fat and lose weight, strengthen and tone your muscles, reduce cellulite, help you feel more relaxed and stress-free with a body massage and be healthier overall. It will help you feel good after a long day at work. You only need to dedicate ten to fifteen minutes a day on this unit to reap results in two to three weeks according to the manufacturer. If you intend to use it for weight loss or muscle toning purposes it is best that you combine it with a regular workout and a healthy eating plan. It runs very quietly and you can easily use it while listening to music or watching TV on the couch at home or in the office. With the level of relaxation, it offers it will help you increase your efficiency at work. And people in the house or at work will not be disturbed by noise. You can adjust the difficulty or challenge with speed levels ranging between 1 and 120. iDeer Vibration Platform weighs 28 pounds and measures 25.9 x 13.8 x 5.3 inches- is compact in size. It is a multifunctional product that lets you try different postures sitting or standing and gives you a fair deal of flexibility. You also have a total of ten automatic programs that will help you achieve your goals faster. If you’re not an advanced exerciser you will be saving money and time by not paying for expensive gym membership fees. And you can simply use it while doing other things like reading a book or watching a movie sitting at home and burn some extra calories and tone your muscles. You can do push-ups, sit-ups, tricep dips, lunges, bicep curls, the bridge on one leg, squats and different yoga poses. You’ll experience triangular oscillation vibrations from its 200-watt power single motor. It is easy to use with the clear instructions and you will feel it working from the first time you use it. We recommend that you start out at low vibrations and build up gradually.